Why Has the Philippines’ Military Struggled in its Terror Fight Under Duterte? Despite advances being made, it has been an uphill climb and the challenge is much deeper than the headlines suggest. Last week, reports surfaced that Philippine President Rodrigo Duterte had asked the country’s legislature to support funding for additional troops as the country’s military continues to battle Islamic State-linked militants in the southern city of Marawi as it has since May 23. The move reflects the Duterte government’s determination to root out the terror threat that has highlighted both the limitations of the Philippine military as well as the lingering fears of a heavy-handed government response that could further exacerbate the situation. Duterte’s call for additional troops was first publicly disclosed following a briefing with key lawmakers last week at Malacanang, which was convened to discuss the terror threat in Mindanao. Senate Majority Leader Franklin Drilon, who was present during the briefing, revealed to reporters that Duterte had told them that he had received intelligence about security threats in several new areas in Mindanao which had indicated that the threat was “serious,” which accounted for why Defense Secretary Delfin Lorenzana had asked for additional manpower. The request for additional troops comes as little surprise. For starters, the Armed Forces of the Philippines (AFP), despite some improvements over the past few years, still remains among the least capable militaries in the region (See: “The Truth About Philippine Military Modernization and the China Threat“). With around 130,000 personnel spread out throughout the country, only a portion of which are deployed and are combat ready, there have long been concerns about its ability to comprehensively manage a range of internal and external security threats following previous decades of underinvestment. That presents an issue for the government with any new challenge as it needs to ensure that even as it moves to secure certain areas under assault, it does not leave others vulnerable to attack. Since May 23, Philippine forces have faced an uphill battle since members of the Islamic State-backed militants began the siege of the city of Marawi after government troops tried to target Abu Sayyaf leader Isnilon Hapilon. As I have noted previously, the Marawi siege had only heightened fears in the region of the establishment of a territorial foothold for the Islamic State in Southeast Asia (See: “ASEAN’s Islamic State Conundrum“). Even though the past few weeks have seen some government advances and administration officials insist victory is on the way, Philippine defense officials have also admitted this has been a huge wake up call for them and that they are now concerned about other areas that could come under assault in the months that follow. For those familiar with what the Philippines is confronting, this is understandable for a wide range of reasons. With respect to Marawi itself, the densely populated city is an easy place for rebels to blend with the population and difficult for Philippine forces to clean out completely, especially if it is trying to limit civilian casualties. Meanwhile, the dense, forested terrain outside of the city is also difficult to completely seal off. This geography does leave room for militants to move in and out of the city. Besides, convenient though it might be, it is impossible in reality to separate the Marawi siege entirely from the broader challenge that the Philippines is confronting. While media accounts have often identified the Maute group as being the primary target, in actuality, the allegiances between it and other groups as well as foreign militants can be much looser, particularly with two raging insurgencies in the southern part of the country with Muslim and communist-linked militants. And amid the focus on casualty counts and troop numbers, in which the Duterte government is itself complicit, it is important to emphasize that the breeding ground that exists for such militancy is due to governance issues that date back decades and have deep political and socioeconomic roots. Amid the struggle that Philippine forces have endured, they have been receiving some external support from countries and reinforcements have been on the way (See: “US Terror Aid Signals Enduring Defense Ties Under Duterte“). But as Duterte’s briefing made clear, the government’s assessment is that still more troops will be needed to secure not only Marawi, but also surrounding areas in Mindanao which could also come under assault. On Sunday, Duterte’s spokesman Ernesto Abella captured the essence of the Philippine military’s ongoing challenge when he said that the additional troop request reflected the need to rebalance “troops in Marawi and other points in Mindanao” to guard areas where threats could arise. To be sure, there are routes to accomplishing this. For instance, following the briefing with Duterte last week, Panfilo Lacson, a former police chief and current chair of the Senate Committee on Public Order and Dangerous Drugs, told reporters that there could be fast-tracking of legislation to increase the troop ceiling, with perhaps about 20,000 more troops for the AFP and around 10,000 for the Philippine National Police (PNP). But Lacson also emphasized that this could be costly for the government, given the budgetary allocations that would need to be made for salaries, training, and equipment needed to support those troops as well. This would be the case even if there are ways to short cut this, including quickening the pace of training instead of leaving it at the usual pace which can take a year or two. Beyond budgetary concerns, there are larger issues as well surrounding the Duterte government and its general approach to the handling of the Marawi crisis and security issues more generally. 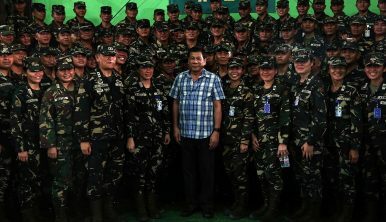 In particular, even though Duterte still possesses strong support among the Philippine people, as well as in both the Senate and the House of Representatives, to be able to pass controversial measures, such as the extension of martial law through the end of the year, such moves, along with his troubling rhetoric which often displays little regard for human rights, due process, and the rule of law, have led some to question whether he is using the crisis as an excuse to impose authoritarian rule in the Philippines. For now, these concerns have not yet exacerbated into widespread opposition that could threaten Duterte’s reign. But if they do in the coming months or further into his six-year term, in facing the Philippines’ most urgent threat, Duterte could yet prove to be his own worst enemy (See: “The Truth About Duterte’s Popularity in the Philippines“).